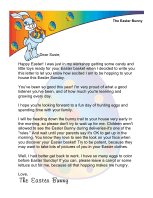 This humorous printable letter from the Easter Bunny suggests to its adult recipient a number of possible reasons for not leaving an Easter basket. I regret to inform you that I was not able to leave an Easter basket for you this year. The reason or reasons are stated below. 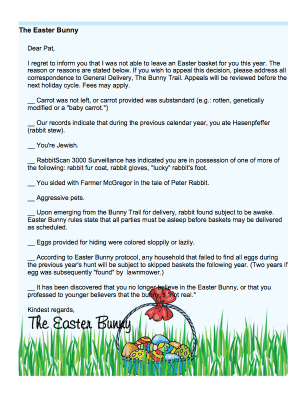 If you wish to appeal this decision, please address all correspondence to General Delivery, The Bunny Trail. Appeals will be reviewed before the next holiday cycle. Fees may apply. __ Our records indicate that during the previous calendar year, you ate Hasenpfeffer (rabbit stew). __ RabbitScan 3000 Surveillance has indicated you are in possession of one of more of the following: rabbit fur coat, rabbit gloves, "lucky" rabbit's foot. __ You sided with Farmer McGregor in the tale of Peter Rabbit. 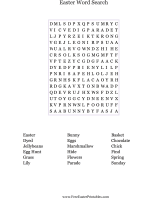 __ Upon emerging from the Bunny Trail for delivery, rabbit found subject to be awake. Easter Bunny rules state that all parties must be asleep before baskets may be delivered as scheduled. __ Eggs provided for hiding were colored sloppily or lazily. __ It has been discovered that you no longer believe in the Easter Bunny, or that you professed to younger believers that the bunny is "not real."